No urban achievements without agricultural achievements (13 May 2012). Let’s take a closer look at the civilizations of the Egyptians, Maya, Greek, Romans, Asians and Europeans, and see how they managed to feed their many cities. Few peoples on earth could so easily build a stable and prosperous life as the ancient Egyptians. Imagine this river Nile, flowing calmly through the deserts of Egypt, flooding its shores every year in a fairly predictable way. If you need to travel north, float along. If you need to travel south, take a sailing ship and the trade wind will push you along. Every time the river floods, in August and September, it waters the shores and leaves behind fertile soil (silt) from the Ethiopian Highlands.The only thing you might want to do is lead the water into basins so that it can stay a bit longer than it would have naturally stayed, allowing the earth to become fully saturated for later planting. You might also want to use these basins to lead the water away from cities and gardens. After the flood, in October, you can then start planting your grains, vegetables and fruits. This is what the Egyptians did. And it is quite an ironic fact that Egypt is nowadays the world’s biggest wheat importer, for with the abundance of wheat they produced in the last 5,000 years, they not only built an impressive civilization themselves, they also played an important role in enabling later civilizations to feed their urbanites. Rome, for example, could only prosper with a lot of wheat from Egypt (21 December 2012). Fame starts with a lot of food in history. And few kings in history could so easily control and take advantage of their people’s food production as the pharaohs (starting with Menes around 3100 BC). Imagine all your subjects living in villages and cities on the shores of one river, producing an abundant amount of wheat and using the one Nile to exchange goods and build a rich culture. The only thing you need to do as pharaoh, is to control that one river and make sure that part of the food and goods is heading your way every now and then. Fast desserts form a natural protection against invasions of massive armies, so you don’t need to spend a lot of your income on maintaining an army of soldiers. What will you do with your wealth? How about feeding an army of workers to build a pyramid? The Maya are also known for their awe-inspiring pyramids, but unlike the Egyptians they had to cope with tough environmental conditions by developing ingenious methods to grow crops in jungle and wetland areas. The Maya civilization first emerged sometime before 1000 BC and reached its peak in the “Classic Period”, between 250 and 900 AD. In this last period, millions of people lived in cities with tens of thousands of urbanites on the Yucatán Peninsula in current Mexico and Guatemala, making it one the most densely populated areas in the world. There are no rivers in this area, so how on earth did they feed the urbanites? Many of the cities in Yucatán were built around cenotes, being their only permanent source of water. A cenote is a deep natural pit, or sinkhole, that exposes groundwater underneath. 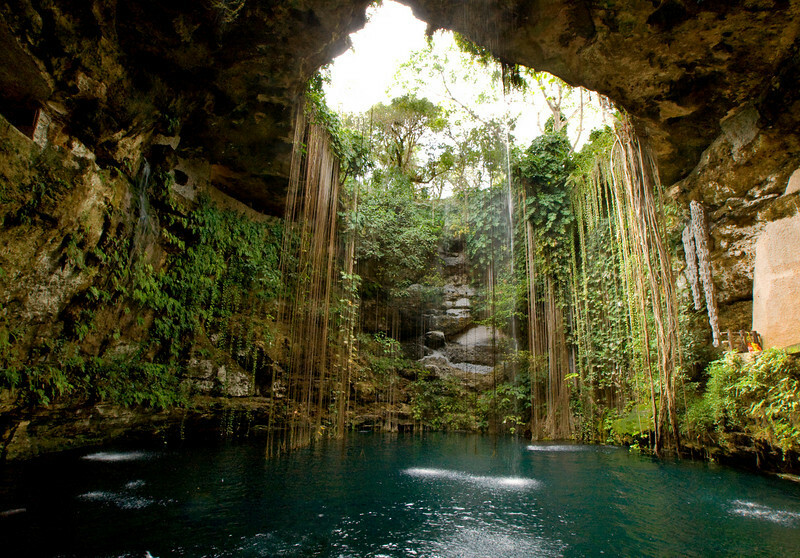 The sacred cenote of Chichén Itzá was by far the most important one. The rain god Chaac was thought to live at the bottom of it. Many humans were sacrificed to appease him, especially young males, presumably because they represented strength and power. Where the Maya couldn’t rely on cenotes, they built cisterns to catch and store rainwater. A milpa is a field, usually but not always recently cleared, in which farmers plant a dozen crops at once including maize, avocados, multiple varieties of squash and bean, melon, tomatoes, chilis, sweet potato, jícama, amaranth, and mucana. (..) Milpa crops are nutritionally and environmentally complementary. Maize lacks the amino acids lysine and tryptophan, with which the body needs to make proteins and niacin (..). Beans have both lysine and tryptophan. (..) Squashes, for their part, provide an array of vitamins; avocados, fats. The milpa, in the estimation of H. Garrison Wilkes, a maize researcher at the University of Massachusetts in Boston, “is one of the most successful human inventions ever created“. Corn (or maize) was the most important and sacred crop of all. For every detail of planting, sowing, and harvesting there was a ritual. These rituals not only turned farming into a highly social and spiritual event, they also ensured that the cultivation of corn was done at the right moment and in the right way, from generation to generation. Equally revered by the Maya was a drink worth more than gold: chocolate. It took no less than 3000 years after its first discovery by the Indians, before it started to seduce and comfort the rest of the world. Cities have a temple (religious centre). Cities have a palace (administrative centre). Cities have granaries (food centre) and water supply. If you have any aspiration of building a city like this, the first thing you’ll have to deal with is feeding the urbanites. For as you know, it is quite typical for city-dwellers that they usually don’t produce their own food. So if you want a lot of them in one place, make sure there are other people who can produce a lot of food on their behalf. Then collect this food surplus, store it, and distribute it among the urbanites. Who can produce a lot of food, much more than they need for themselves? Who produces food that doesn’t rot but can be stored for a longer time? Why would these people be willing to give you their extra food? How will you collect this food and distribute it among the urbanites? Ad 1. Hunters and gatherers didn’t collect enough food to feed a city or even a village. It was only after the arrival of agriculture that people started producing so much food that they could also feed a substantial amount of other families. 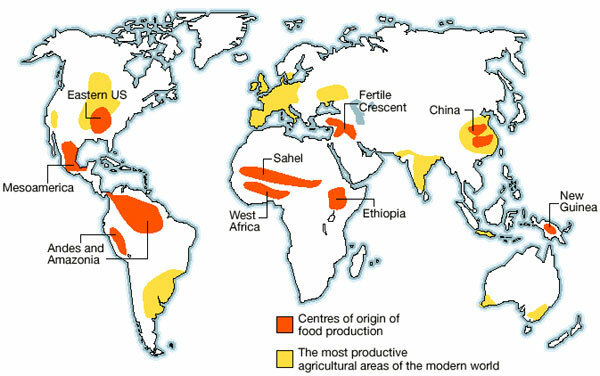 The first centres of agriculture appeared in the Middle East, China, New Guinea, Ethiopia, West Africa and in North, Middle and South America. Ad 2. The Papuans in New Guinea didn’t need the rest of the world to develop agriculture. But the food they produced (sugar-cane, carrots, banana’s) couldn’t be stored for a very long time. This made the rise of cities impossible. Wheat can be stored very well and became the basis for new civilizations in the Middle East, China, Ethiopia and West-Africa. The America’s were blessed with cassava, corn, potatoes and beans. These storable crops laid the foundation for civilizations like that of the Inca in South America and the Maya in Middle America. Rice gave rise to a lot of civilizations in southern Asia. But that took a bit longer as it takes quite an effort to establish “wet-rice cultivation” (requiring a constant supply of water). Ad 3. It didn’t take long before farmers saw the benefit of exchanging their extra food for all kinds of goods or services. So, there was trading way before the arrival of the first civilizations. Already in the 10th century BC the first walled cities, like Jericho and Damascus, appeared. It took, however, until 3500 BC before cities became so big and complex that they became known as the first civilizations. The difference was that one particular group had moved into the centre of society and gained the authority to collect food and spend it on activities that was believed to serve the common good. Which group? Priests. Which activities? Rituals to please the gods. Why was this a common good? Because the lives of farmers and settlers turned out to be much more vulnerable than the lives of hunters and gatherers. Farmers could lose their harvest due to hail, insects, drought, floods or looting. People could also fall victim to ugly diseases their domesticated animals were carrying. 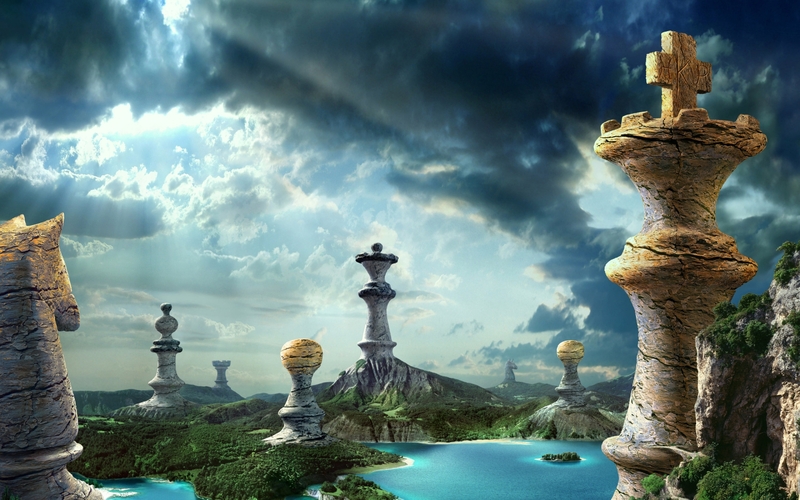 As the farmers and settlers couldn’t control these factors, they turned to those who claimed to know the will of the gods and how to gain their protection. The power of priests increased. At first they performed simple sacrificial rituals at the fields, but gradually these rituals turned into refined and complicated ceremonies in one particular place. Statues and temples were raised for the gods, with ritual meals and dances several times a day. In order to make all of this possible, the priests collected food from the farmers and stored it in granaries. The food was used for sacrificial purposes and to feed all the priests, craftsmen, cooks, dancers, tailors, administrators etc. who were involved. As the food production increased and improved, more and more people settled around the temple, all spending their time on other things than producing food. Ad 4. Close to the religious centre and granaries appeared an administrative centre, focussing on collection and distribution of food. It soon developed into the centre of social and political power. Priests did not only pull the string because of their astrological knowledge, helping them to discern the will of the gods. They also knew when to sow and when to harvest because of their astronomical knowledge. They literally had a powerful sense of time. Through a number of rituals, accompanied by myths, they set the rhythm of agriculture and made sure the consumption of the food was spread over the year. As the city grew, more and more products were also traded outside of the temple context. Markets started flourishing. And the more the temple, granary, palace and market became concentration points of valuable goods, the more the settlement had to be defended against looters and criminals. Soldiers were needed, trained in barracks, and thick walls had to be build around the houses and public buildings. From then on, it would only be a matter of time before the priest-king would be replaced by a general-king. This is how many complex urban societies developed in history, carrying the 5 well-known features cities have had since the very first civilization.